The planet Neptune is also known as the eighth planet from the sun. Neptune had what’s called a Great Dark Spot (aka GDS-89) that was discovered by NASA’s Voyager 2 in 1989. The spot was actually many smaller spots which were actually weather storms known as anticylonic storms. The spot could no longer be sighted when it was looked for in 1994, but was replaced by a new weather storm / spot which was found in a different part of the planet. The spot was dubbed the Northern Great Dark Spot (aka NGDS). Neptune was named after a the god of the sea from Roman mythology. Other names that were considered for the planet included Le Verrier’s planet, Janus, Oceanus, and the planet exterior to Uranus. Does Neptune have any moons? Triton – Discovered in 1846 and is Neptune’s largest moon. One oddity about this moon is that it is the only large moon that orbits the opposite direction from the planet! 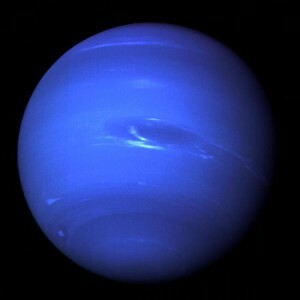 Neptune is 4,503,443,661 km from the sun. Neptune’s rotation takes 16.11 hours or .67 Earth days to complete. One year on Neptune actually lasts 164.8 Earth years.